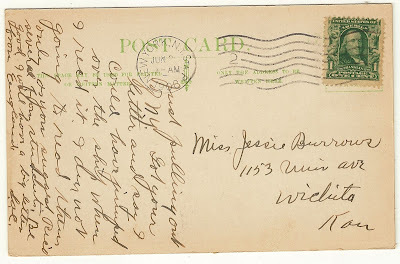 Just pulling out of N.Y. Got your letter and say I could have jumped over the ship when I rec'd it. I am not going to read them only as you suggest. Rec'd several from students. Be good. I will have a big letter from England. S.A.C. 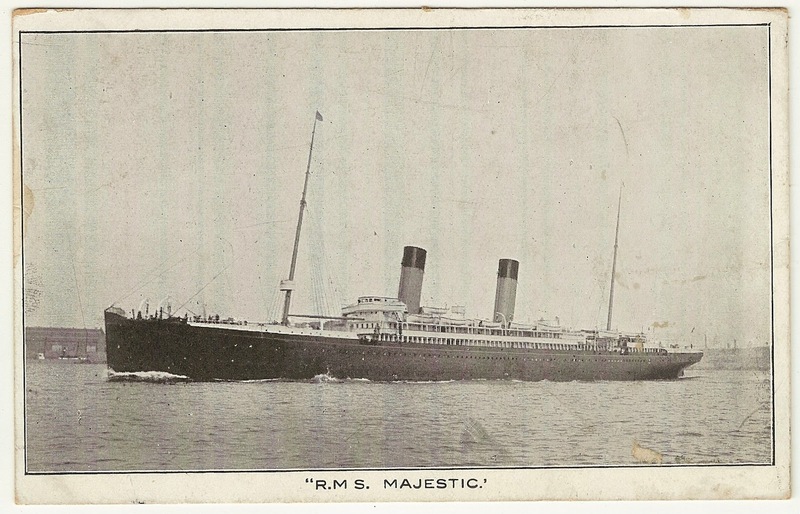 The ship seems to have been the earlier of the two Majestics operated by the White Star Line. I would *love* to be able to take a tour of those old luxury liners. RMS stands for Royal Mail Ship. 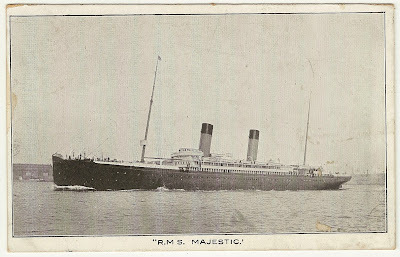 According to wikipedia the Majestic was initially launched in 1914 as SS Bismarck. But Virgil is right, there was an earlier version build in 1890. One of its captains was Edward Smith, the future captain of the Titanic. It crossed from NY to Liverpool in 5,5 days. In 1899 and 1900 it transported troops to South-Africa during the Boer war. In 1912 it replaced the Titanic when the latter had sunk. A fitting name for an elegant vessel. I meant to comment as I have been thinking about ships lately but it must have slipped my mind. I love the lines of ships from this period -so stately and regal. Quite a contrast from todays gigantic bloated cruiseships. I'm not a fan of the new boats. I tell my wife the only cruise she'd ever get me on is one of the sailing types where you get to help sail the thing. Virgil, i agree with you. Rob, Thanks for the additional information. I was did not know about the RMS designation. I find it interesting how few years these stately ships were in service during the heyday of ship building. This one was only used for 24 years. RCT, I agree with you, I love the sleek lines on these old cruisers. In comparison, the cruise ships today seem obese. I think the difference must be that older ships were also built for speed, whereas the ones today aren't concerned so much about time. Although, curiously enough most modern cruise ships are faster than these older ones (even though they look like they wouldn't be) just because of increases in technology. Excellent. Loved the blog, especially the detailing. Thank you so much. I am myself studying at IPEM and if you are interested Top Best MCA college in Ghaziabad, than IPEM is one of the best option. You must check it out.